HiFlex 1 in. 2-Hole Replacement Collar Straps. $7.95. "These HiFlex replacement collars are easy on and easy off, and I can put any collar on any dog and get the proper fit." I have always disliked the straps that come with the invisible fence collars. The plastic clasps break, and they are easy to put on incorrectly. In addition, they have to be painfully sized to each dog. These HiFlex replacement collars are easy on and easy off, and I can put any collar on any dog and get the proper fit. Also my Petsafe receivers fit perfectly. "I put them on and off multiple times a day, and they hold up very well." These collars are so durable. I put them on and off multiple times a day, and they hold up very well. I have had these for 5 years now and will not use any other collars. Yes I like the straps. They serve what I needed, and the price is good. Exactly what I was looking for good price and shipping was fast. This is my second order from here in 2 months. Great service. Love it. I think a plastic clip, or other quick release connector instead of the traditional buckle would make it easier and quicker to take on and off. The material it is made of is much better than what came with the collar system originally. These are great in the field and wipe off easy! Love the colors Steve! Keep the vendor! Cheers! 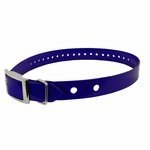 Nice to find a waterproof sturdy collar that has predrilled holes for a Petsafe electric fence collar. My dogs like to run in our woods and inevitably get their collars stuck on branches or tree trunks when they are searching out small furry creatures. 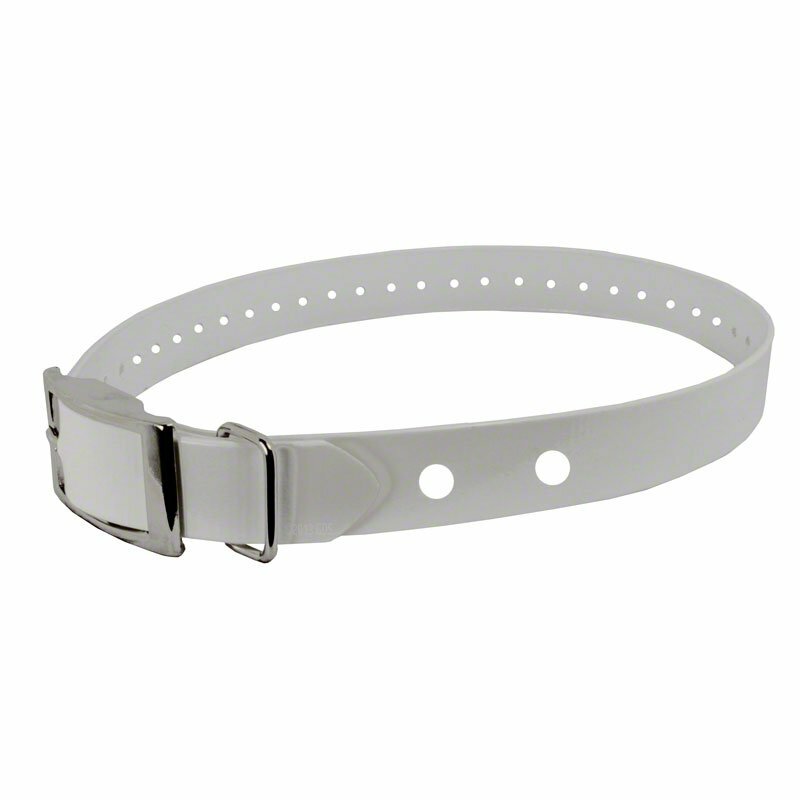 These collars have metals buckle instead of plastic snaps which always end up breaking in these conditions. So far these new collars have been perfect -- and extra long, too. Great replacement, good quality. Love the colour options! Great replacement for the standard Pet Safe collars! Great visibility from a distance, and the buckle is more secure. Perfect replacement!! Quick shipping! I liked that slip had a hand written thank you, something that is hard to find. Collars are great with petsafe receivers, the fabric ones that come with them break way too easily. Nice! Great collar for my wireless system! Very sturdy collar and we love the color. The collar is working well, and I really liked having so many color choices! Also, it was so nice to have the holes already punched for the SportDOG underground fence unit. This replacement strap was exactly what I needed for my old Innotek E-collar (10 years old). It was extremely affordable and delivered quickly to my house. Best quality I've found. Great price. Great customer service! "This is an awesome collar." This is an awesome collar. Very durable and well priced. "The collars are great, very versatile sizing with multiple holes." lab and retriever mix. Family pet. 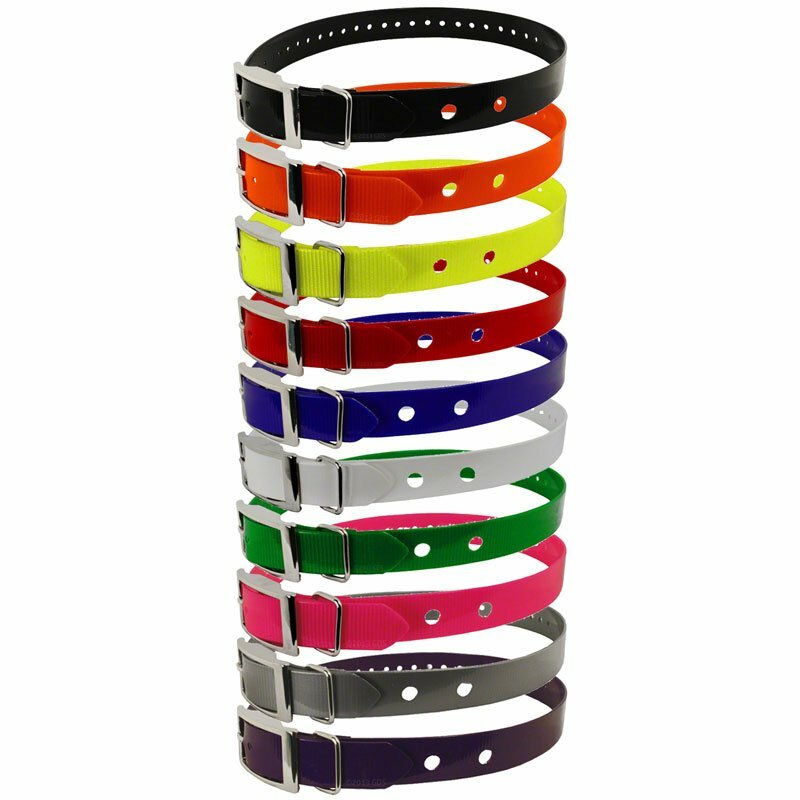 The collars are great, very versatile sizing with multiple holes. Love the wider width that supports the fence transmitter well. The price is great and will definitely buy again when (if) new collars are needed. These collars are great! The old original (Radio Fence) ones the dogs loved to chew off of each other, but these they don't seem to chew on at all! "So far they've held up great." So far they've held up great. "I am so glad we found these collars." I have difficulty fastening the quick connect collars and wiggling dogs does not help. The HiFlex Collars are very easy to put on my dogs. I am so glad we found these collars. "I've been using these for 2 weeks now and so far they have stayed on!" These work a lot better than the collars that came with the electric fence. The dogs would rip those off of each other while playing. I've been using these for 2 weeks now and so far they have stayed on! No more searching the yard trying to find their collars, or worrying every time I let them out! "These collars are awesome and bright." 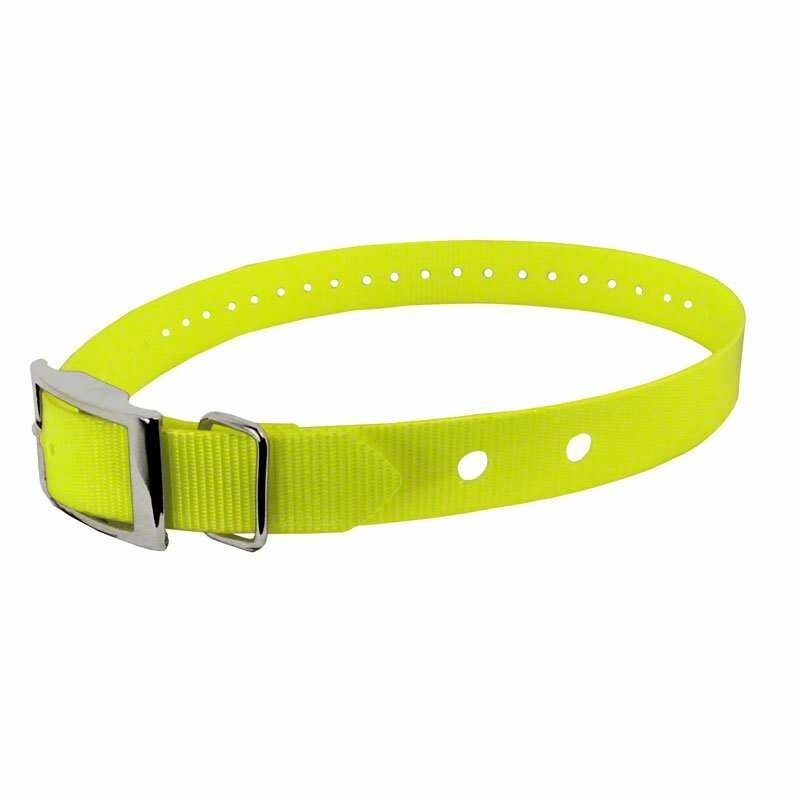 These collars are awesome and bright. 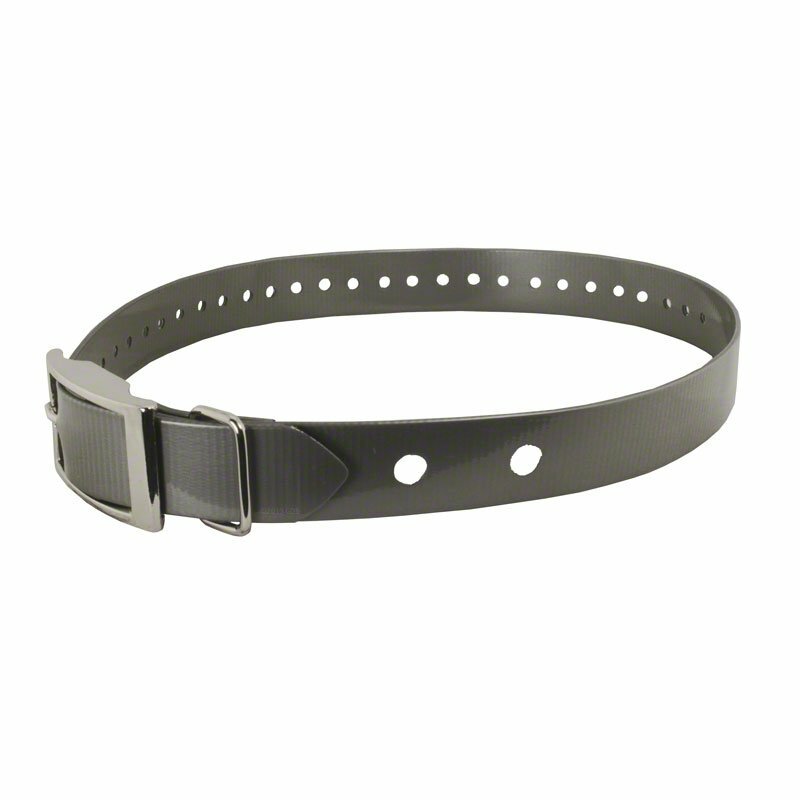 They are longer with more adjustability than the original collars that came with the sportdog inground fence. "I feel this was a fantastic purchase." I have purchased collars on other sites that seemed as though they were replacement collars for the SportDog In Ground Fence System, however, when they arrived they did not have the appropriate holes for the unit to be secured to the collar. The collars here have the needed holes, are of good quality, an excellent price, and the color selection was excellent. The shipping was prompt, and the shipping fee was reasonable. I feel this was a fantastic purchase. "Nice product, and fast shipping." Nice product, and fast shipping. Would do business with them again! "Exact fit and received shipment very quickly." Product was an excellent replacement for worn collars. Exact fit and received shipment very quickly. "Best collar I have used." 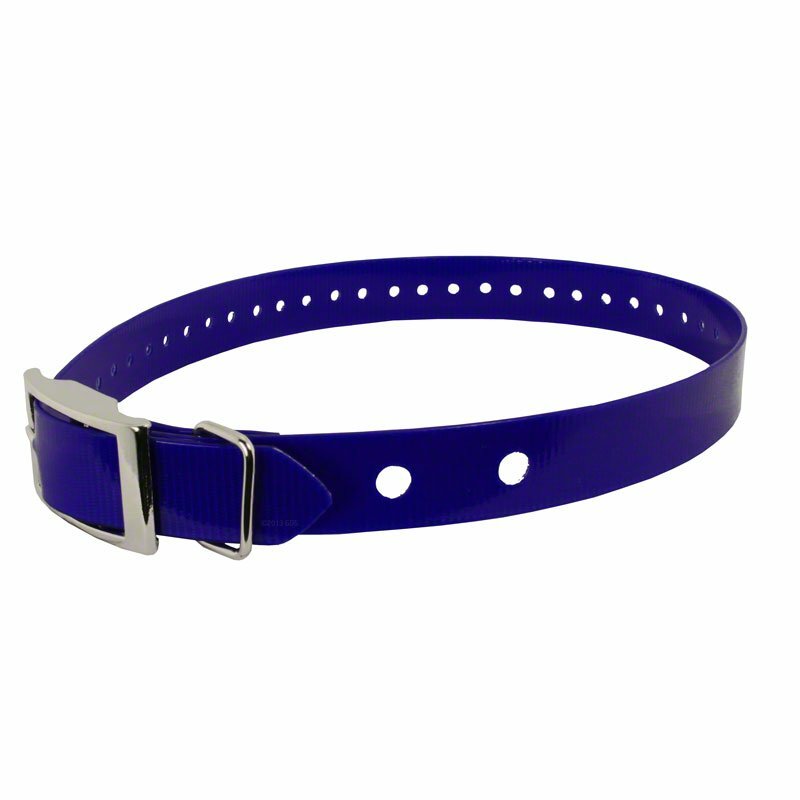 Best collar I have used. So cute! And so much better than the ugly red cloth collars that come with the underground fence system (ours is PetSafe). Our old ones kept sliding and loosening. These are great because they stay clean and stay put with the buckle. Oh, and I can show our dogs personality a little more with the assortment of colors to choose from! Great price for a great product! "Great service and timely delivery." Better collar than the original invisible fence collar. Great service and timely delivery. "Seems to be pretty durable"
Seems to be pretty durable, hopefully my dogs won't chew it off of each other! My biggest problem with the replacement collar strap is it barely fits the St Bernard. I had to make a new hole at the very end of it to be able to use it at all. Replacement 1" collar straps for dog training collars that only require 2 holes. Replaces the RFA-81, GDS-81, and RFA-48. Does NOT fit Garmin Astro DC-40.